This event is sponsored by Metro, BPS, and NECN (the Northeast Coalition of Neighborhoods) and allows us to collect reusable items, broken or unwanted electronics, books, clothes, household junk and old furniture just to name a few. It is the same stuff you would take to Good Will or the Metro transfer station with the convenience of one stop dumping. This is the only fundraiser for our neighborhood annually and the fees that are charged are used to sponsor events and neighborhood activities. Also, the neighborhood association is a 501(c)3 non profit so any donations are tax deductible which is another bonus besides having cleaner closets, organized basements and clutter free garages. There are a few rules that Metro will STRICTLY enforce. We absolutely can NOT ACCEPT any wood, paint cans, remodeling debris like ceiling tiles, dry wall, flooring, siding, insulation, electrical wiring or panels, or fire proofing materials and refrigerators or anything that might contain asbestos or lead. They are not allowed in the landfill in the city of Portland so we cannot collect them. We also can NOT take any yard debris, dirt, stumps, hazardous materials, household garbage or curbside recyclables. 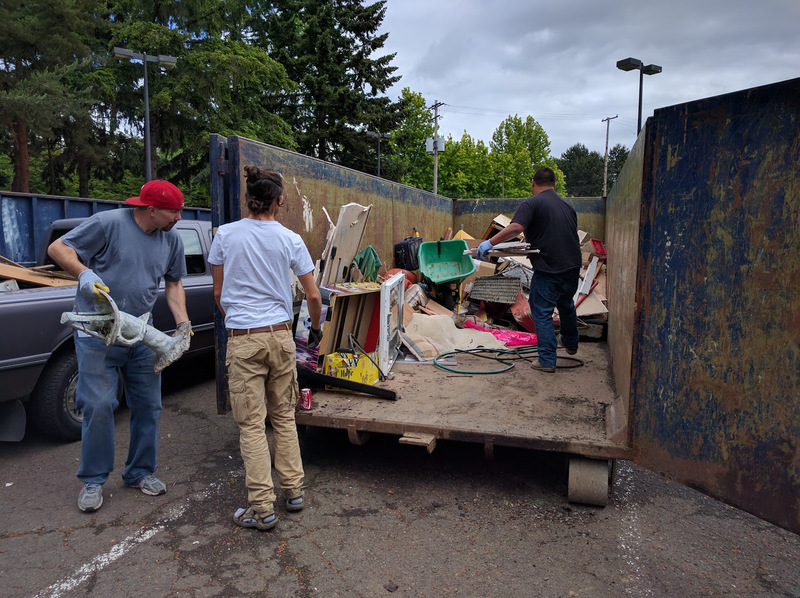 Outside of those prohibited items we can take other items that would fit in a dumpster. We CAN, however, take your scrap metal and anything with a cord thanks to Green Century Recycling. Household items and furniture will be delivered to Community Warehouse. Books will be taken to the Children’s Book Bank (new to the Eliot neighborhood) and Title Wave Books. There will be an onsite swap meet so come by and see if anything suits your fancy and bring a bag of things you’re willing to part with… or fill up your car’s trunk or pickup truck. We do offer a pick up service for seniors and disabled with a prior appointment. Please see the Eliot Cleanup 2017 Flyer for more details on contact info for pick up or to offer to volunteer. We need people to help with unloading, sorting, traffic control and photography as well as for our walk around trash pick up. Hope to see you there! More info, fees, what to bring, what not to bring and contact information can be found in the Eliot Cleanup 2017 Flyer. Previous PostVolunteers Needed for Litter Pick-up Event Next PostWhere to Get Financial Assistance for Childcare?